Martwayne | Power Through Fashion: The Appalling State of Customer Services in this Environment! 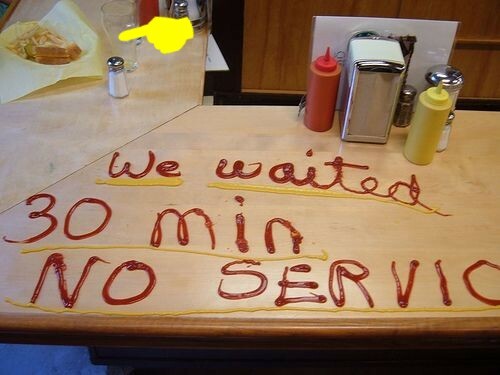 The Appalling State of Customer Services in this Environment! I'm sorry but this is ranting and raving time! I did warn you that it may happen sooner or later but it really is annoying! Someone please explain to me why exactly I am paying for a service and when I complain about the service, I get attitude from the vendor like "errr.... how dare you complain about the service I just rendered to you"! I mean like seriously?! The typical vendor around here acts like they are doing you a favor when really the truth is you have paid for it! Sometimes they forget that without customers, they would not be in business! So in preparation for FEC 5, I paid for some sponsored online content to advertise the course. An error was made in the content which I called the vendor's attention to. No biggie right?! So imagine my shock when I got a mail from them; one which "reeked" of attitude to say the least. Thinking I was, perhaps, overreacting, I forwarded the mail to a friend of mine asking his opinion and he confirmed that the mail was rude. Now the normal me would have either sent a stinker or forwarded the mail to a higher authority in their management asking for an apology without batting an eyelid. But seeing I am reading and learning a whole lot from The Book of Proverbs, it took every "ounce" (for lack of a better word) of energy to hold my "tongue" and let it go! Like everything else in this environment, we just let go! And that is what really irks me! Ok let's just assume the sender of the e-mail didn't mean to be rude. How about some basic training on e-mail etiquette?! I know when I was in KPMG, we spent a whole lot of time reviewing and re-reviewing the contents of an e-mail before sending them out just to be sure we never passed across the wrong message to the reader. Clearly if this person had reread the contents of the mail, they would have rewritten it. You go to a bank and the disgruntled Customer Services personnel is frowning and answering your questions grudgingly like he was forced to sit behind the counter. You even get customers coming in and cajoling the staff just so they can do what they were actually employed to do! I know I have had to complain about a certain person in a certain branch of a popular bank who really has no business attending to customers. The person constantly has a frown on their face and I always wondered why the person wasn't relegated to the back room wearing a mask and counting money. That way they can frown all they want and no one would notice. Like seriously?! If you don't like your job then please quit! Why do I have to beg you and call you Aunty or Uncle just so you can be decent to me?! Interesting to note that customers on the Mainland are treated differently from customers on the Island! Double Standards! Gosh need you need to know the different vendors I deal with on a daily basis.... especially the creative ones who outrightly expect you to accept what they have given you without any questions asked. Like hello?! I know how particular I am about my work so I spend hours chatting to them about the deliverable and send a detailed line-by-line brief itemizing everything you could possibly want. After all that effort you get the work and sometimes I have had to blink several times just to be sure it was my work they sent to me. And when it dawns on me that it is my work, then the anger sets in and you wonder if they even read the brief you gave them. And when they don't deliver, they either try to intimidate you, accuse you of "micro-managing them", threaten to back out of the work expecting you to beg them after you've paid them and they have constantly missed their deadline or worse, tell you no one has ever complained about their work. And I'm thinking, get over yourself dude! In the past I have had to cajole but after a while I was like oh like puh-lease! Someone please explain to me why I have to beg someone to do the work I have paid them for?! Or tip a parking attendant to park my car! Like seriously in this environment, some people you tip even reject your tip because, in their opinion, it is too small! Sometimes I cannot help but wonder if some employers knew how their staff handled their business. I'm sure if they knew, they would have a fit! And yet you wonder why there is such a moral decay in this society. Being accused of being "too finicky" simply because I asked for the measurements of a table. Why? Because the representative was too lazy to get a measuring tape! He tells me "it's a standard size"... like that is supposed to mean anything to me! Standard size by whose standards?! And THEN he tells me I'm too finicky. Like how can you even tell a customer she is too finicky! And oh! When we asked them to close the door because there were a lot of mosquitoes in the waiting area, he apologizes and then wrecks the apology by adding "but we are all Africans now". We are all Africans so therefore we should be used to being chewed to bits by mosquitoes! Maybe he's used to it but sorry, I'm not! Oh wait! And how about staff talking about you amongst themselves like you are not even in the room. Another common one! Complete lack of courtesy! I have had to tell people off several times for doing this. And why do they get away with this?! Simple! Because the average individual would rather not say anything for fear of being embarrassed or being seen as a trouble maker. I know the only time I get my work out is when I rant and rave! So what do we do? We just keep swallowing the crap and then complain that our government isn't listening to our complaints and cries. Ever heard of charity beginning at home?! Why would someone listen to you when you refuse to listen to someone else? Those that tell you "well there is nothing you can do about it' like I don't know my rights or something. Or some concoct some ridiculous story like you just left primary school and you are there thinking... "does this guy really think I'm a mugu or something?!" Why is he telling you this story?! Because he cannot be bothered to do the work! Gosh! We really do indulge people in this environment. What happened to the customer being king?! Clearly it's unheard of around here! I get a visit from the ISP technicians and rather than accept that their base station is bad, they tell me the network in my building is bad. I'm like.. oh... suddenly after 2 years. The solution?! The network is much better outside. Right! So I should stand outside in the rain to use my laptop?! Makes me wonder why I even bothered! After all, even their office had no reception. I had to stand outside to test the modem to be sure it worked. And then I get a call from the ISP asking why I refused to renew my subscription and I told them. And she ends the call with "Thank you for choosing..." I'm thinking?! What?! Did she even listen to me at all or did I just speak to an answering machine?! I tell you why I have refused to renew my subscription (after paying for 3 months without enjoying a minute of the service), meaning I no longer use your company's services and you end the call by saying: "Thank you for choosing...". Ridiculous! And how about our Emergency Services?! Ha now THAT is another story entirely! You will just keep waiting! The day after the Dana Air crash I heard some violent sparks and some smoke coming from somewhere that seemed really close. So I called "emergency services" and this "bored girl who sounded like I was disturbing her manicure session" picks up the phone and asks me to go closer to identify the source of the smoke before they can send the rescue team. I was like what?! Should you not be telling me to evacuate the area?! We eventually found out it was the PHCN cable and residents had to let it burn to a "comfortable" height in the rain before putting out the fire themselves. Sigh....... I can go on and on. But really, what I find really upsetting is the fact that many of us just allow ourselves get exploited. Despite being educated, we would rather suffer in silence. No wonder people snap and the average person is stressed out around here. My question is... when will this all end?! I refuse to be made to feel guilty simply because I am asking for corrections to what what I am entitled to. It is not a right, it is an obligation! Interestingly enough, no prejudice to indigenes or anything, but I wonder if this only happened because the restaurants were run by foreigners?! I don't know. But one thing I do know is many of the ill treatments I have received have come from Nigerians.... our fellow "compatriots". Which is very sad! At least I have been able to let go of some steam! Thank you for lending a "reading eye"! Basic Fashion Course for Juniors - Start Date to be announced soon! Basic Course in Pattern Making & Garment Construction - registration ends 13 July 2012. Yes you do come across difficult ones and when you can't handle them, offer them a sincere apology, an alternative or a refund. Simple! In a nice way of course... :-D Perhaps we can all learn from this particular post on customer service! I know many people around here need it! That's the typical lifestyle of the modern african service providers... but then they say they're acting Western. Ignore them for a while and act!